Don't Plant Over Top of Your Tulips! | Gardens Alive! Our bulbs get subjected to too much watering and fertilization if we plant annual flowers over top of them. Your advice was that once the greenery had died back it was better to dig the bulbs up and place them, layered by type, in a pot, separating the layers with a mix of alternating layers of peat and vermiculite. You advised (I think) continuing to water them albeit not any more frequently than a normal rain schedule would provide. So I did this. But then I searched the Internet for corroboration, and the information I found implied that it would simply rot the bulbs and provide a buffet for local field mice and/or squirrels (and deer if they found the container). I "watered" the collection once; after that, they just got rain. Did I do right? A. You got it mostly right, Tina. Your biggest mis-hearing was the watering part. I HOPE I said NOT to add ANY water, just to allow rain to hit the container they're in. But let's start back at the beginning. This advice came from one of the best interview guests we've ever had on the show, British gardening writer Anna Pavord, who was on tour in April of 2000 promoting her beautiful 1999 book, "The Tulip." During the interview I mentioned that failure of tulips to return reliably was one of our most frequent questions. Her instant reply was "that's because you Americans plant annual flowers overtop of the bulbs and then water and Miracle-Grow the hell out of them, rotting the poor bulbs underground." In their native mountains of Russia, Turkey and Afghanistan, Spring bulbs have evolved to survive in a fierce and mostly God-forsaken climate, she explained. When heavy snow and freezing cold finally gives way to a fairly pleasant Spring, the bulbs that have been hiding send up their shoots, flower, absorb lots of solar energy and then the above-ground growth fades away and the bulbs hide again, this time from a dry, glaringly hot summer. So their DNA doesn't know from summer moisture and food; they know hot, dry and desolate, explained Pavord. That's why they don't take well to beds that are watered and fed all summer to keep marigolds or begonias or petunias alive. She added that she too has limited garden space, didn't want to leave her bulb beds empty over summer, and so learned this lesson the hard way herself. When she did realize what was going on, she began lifting the bulbs, storing them for the summer and replanting them in the Fall. It worked very well, she assured me and my listeners, with a fair amount of margin for error. I tried it that summer and every summer thereafter, have never done it exactly the same way twice and it has always worked. That first year, I dug up the bulbs after their greenery had faded and took them to the back of the garden, out of sight and out of range of the sprinkler. I banged a bottomless box together out of junk wood, put a couple inches of soil in the bottom, then a layer of one kind of bulb, then more soil, more bulbs, etc., until it was filled to the top. It only got watered when it rained. And when we had long rainy spells, I covered it with a tarp. I dug them out in mid-October, re-planted them around Halloween and had great results. After a couple of years, the box rotted to nothingness and I switched to big pots that had cracked or ripped or were just plain ugly to begin with and had never gotten any better. This works just as well. 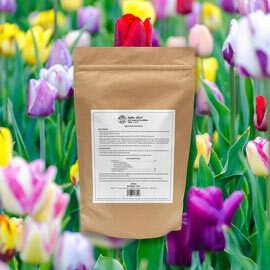 Sometimes I mix in a fair amount of peat and/or vermiculite and/or perlite and/or nice light professional potting soil blend if I have it; but if I don't I just use my compost-enriched garden soil. I've never had mice or squirrels muscle in and never lost more than a few to rot (and they were probably already damaged by my tender digging-up style, which involves a lot of creative swearing). I love the image of Bambi chowing down through several inches of dirt in the hope that treasures lurk below, but I don't think that even deer are that dim. After they bloom, remove the faded flowers and any seedpods that form. Feed the greenery so it can produce a new flower for you next year. This previous Spring bulb Question of the Week has lots of feeding details. Leave the greens alone until they have completely lost their green color. Lift the bulbs. The best way is to gently tug at the faded greenery and coax the bulb out of the ground slowly after it turns tan or brown. If it snaps off, go digging; but be careful. Store the de-greened bulbs outdoors in a container with excellent drainage, in sun or shade; in soil, soil-free mix or a combination. Do not water them; and cover the container for long rainy stretches. Replant in the Fall. That's September in the Far North; October in the mid-Atlantic and after Thanksgiving in warm climes.